Energy efficiency is one of the most important needs of a highly dynamic grocery store today. Long opening hours and higher demands from the customers regarding a unique shopping experience are some of the most challenging aspects of a lighting system. 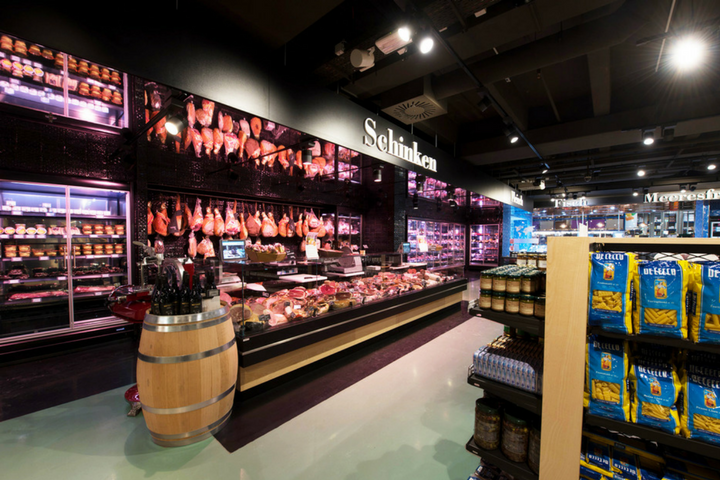 Lighting truly makes an impact not only when it comes to the supermarket design and the inviting shopping experience, but also on the energy usage. We've gathered three of the best tips to help you create an energy efficient and sustainable retail environment, while keeping an eye on the comfortable ambiance in the supermarket. The latest trend is to illuminate the food store the same way you would illuminate a fashion shop. Why? Because food shopping has become so much like fashion shopping - a trip centered on experience rather than just filling your weekly staples basket. So you have to make sure you have the right level of contrast between general illumination and accent lighting. In this way, the focus of the shoppers falls on the desired aisles or displays. It also helps shoppers gain a feel of the space and easily navigate through it. Increasing light intensity on the most important fresh products such as fruit, vegetables, bread and meat will instantly attract the customers towards those areas. Decrease the light intensity instead, and you'll obtain a homely feeling that will make customers want to spend more time in the store, browsing. Using these light design principles, brings energy efficiency and also improves customer experience. Why not also use track spotlights equppied with different color temperatures for highlighting certain groups of products or seasonal items? Read more about how to better integrate the special colors in the fresh products areas, here. In conclusion, combining intense light exactly where you need it with diffuse general light will considerably lower the energy consumption and the usage of the luminaires in your supermarket. The advanced technology of LED lighting solutions makes a great difference when it comes to creating a sustainable and energy-efficient supermarket. The good news is that the components in the LED modules are constantly improving. The system is also getting more efficient and the lumen output is continuously upgrading. What are the advantages of using a LED lighting system when you wish for a more efficient supermarket? Firstly, the life span of a LED system is much longer than other light sources. LED lamps guarantee as much as 50.000 operating hours compared to a halogen lamp that has around 12-15.000 operating hours. The low need of replacing a luminaire or the costs of maintenance should also be considered. Secondly, the balance between efficiency and comfort should be taken into consideration. Powerful reflectors orient the light in the desired direction and anti-glare protectors screen off the light so that the eye is not dazzled. On the other side, powerful but low consuming luminaires reduce the number of spotlights needed. This way, you can easily increase the distance between luminaires on the track but still retaining the same light levels. Moreover, LED light enables you to easily change color temperature and improve the appearance of your products, bringing an upgrade on the aesthetics of your products. Read more about how to create a light design that highlights an exclusive delicacies store, here. Lastly, regarding the total costs of a LED lighting system, it can be a more expensive investment at the certain time, but it will definitely be a long-lasting choice and the cost will be paid off in the long run. How can you make a lighting system in a supermarket even more efficient? Through smart lighting control systems! Light controls help save energy, decrease the whole supermarket's energy usage and also contribute to dynamic lighting effects that enhance the shopping experience. The best things you can do with a smart lighting system in order to save energy is to dim the light, create lighting scenarios and optimize the energy consumption. For example, a luminaire that is 20% dimmed, wont't be detectable by the human eye, but it will generate energy saving of 20%. A smart lighting system can be controlled through a simple app, free of cabling, control panels or wall switches. That's great, isn't it? Presence sensors that detect movement are also a good way to save energy and to contribute to the dynamic light effects in the supermarket. You can choose to create interest and attention towards a specific area by increasing the light or, by contrary, lower the light when no one is present in the area in order to save more energy. Lighting scenarios are great for setting the amount of light you need in certain days of the week and at certain hours when there are no customers around. For example, perhaps you need less light before opening or later in the day when the supermarket is less busy. Lighting scenes can be easily controlled by setting a timer, or manually. LightOptimal sensors become active when you want to adjust the lighting in the supermarket according to the amount of natural light that comes from outside. This way, you can adjust the light according to the time of the day. For example, if it's dark outside you can increase the lighting by creating a contrast. A smart lighting system is a great opportunity for energy savings. Lighting controls are perhaps the most efficient energy saving solutions for a supermarket at the moment. All in all, there are some notable advantages that will convince you LED lighting systems are the future of sustainable supermarkets. The links between energy consumption, lighting solutions and environmental impact are getting more and more visible. The entire cost for implementing a LED lighting system is an investment cost, as the maintaining costs, the CO2 emissions and the energy consumption will decrease over time. There are many ways to obtain energy efficiency in a supermarket , and they all contribute to the perfect store: modern design, easy navigation, well displayed products. What they all have in common? The need for a perfect lighting system. The light that will highlight the display in the supermarket and enhance the experience of the customers with a maximum energy efficiency. And the best lighting system offers both.